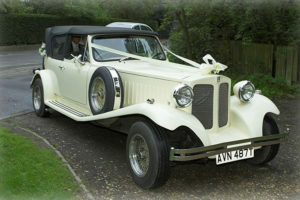 Orton Wistow based Elegant Cars offer a 1930’s style Beauford Tourer which is actually a replica of a 1929 American classic tourer but don’t let the replica tag put you off – the sleek lines of this long bodied gem will turn heads as you cruise past ! Needless to say, the car is always presented in immaculate condition with plenty of room inside too. 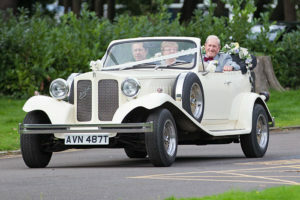 There is a soft top option if the hairstyle can handle it and, if it can’t, you can still pose with the roof down for some excellent photos after the service. 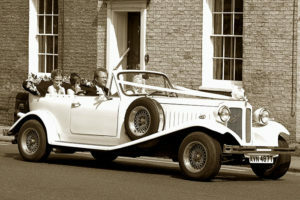 The owner/driver provides a first class supporting role both in terms of appearance and in his relaxed and accomodating manner. Check out the website for further photographs and information, including details on prices. A great package that sits at the very top of the list for me !